I am Girish, from near Kukke Subrahmanya, Mangalore, Karnataka. My father is a farmer and mother is a housewife. Agriculture is the only source of income for my family.I am working in a private company and my salary very low and somehow managing the family. 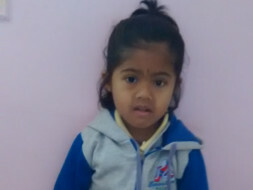 Our daughter name is SAANVI, She is 5 years old .We live near Electronics city, Bangalore. 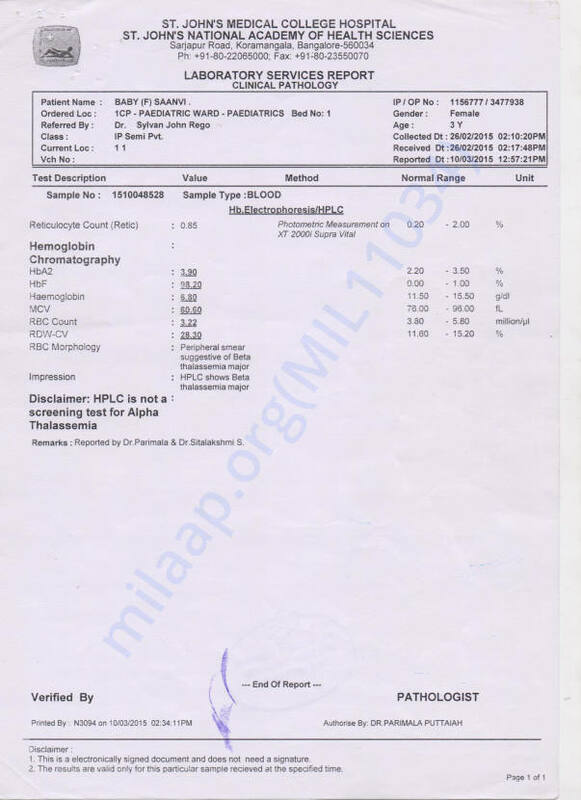 When She was 3 years old, we came to know that she is suffering from Thalassemia. It was a shock for me and my family when we got to know what kind of disease is that and how to give treatment for my daughter when there is no extra income for me. I checked in few local hospitals in Bangalore and took treatment for my daughter. But it was not enough to cure it in a proper way. 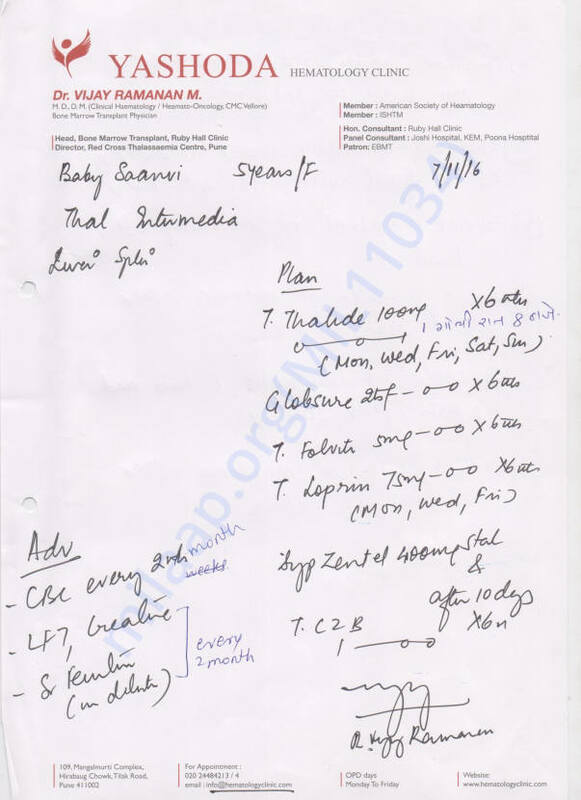 Some how I got to know about Yashodha Hematology Pune, and started treatment since 3rd July 2015. Doctors are trying to cure the disease with medicine but there is no enough progress as of now. As suggested by doctors, Bone Marrow Transplant(BMT) may be required anytime if this medicine doesn’t work anymore. 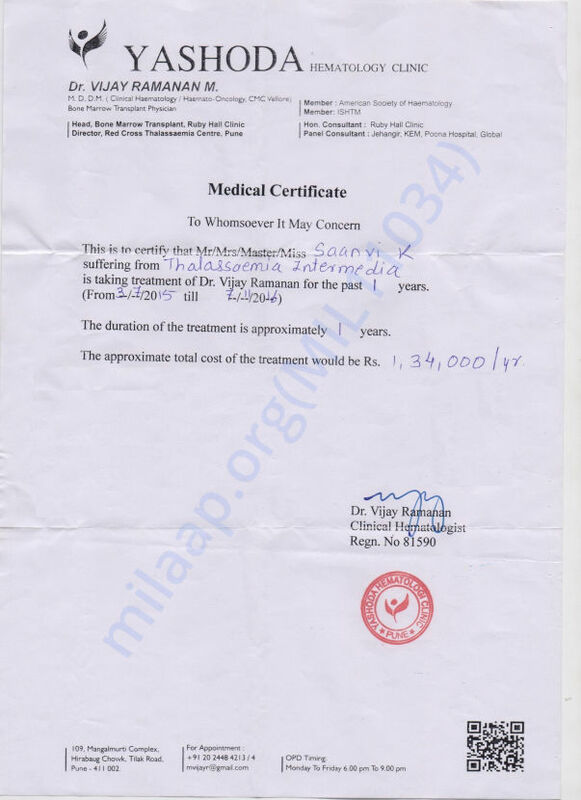 Presently I am spending 134000/per year for this treatment through medicine. I somehow managed this amount as my friends and family supported me. But it is a huge challenge for me to give this treatment to my daughter. I kindly request the donators to help my daughter SAANVI’s treatment and save her life. She is the only daughter for my entire family. Bless you. May you get well really soon. Please keep me updated about the child's health. Please pray to Jesus for her healing. He is a loving God who answers the people who call on him.